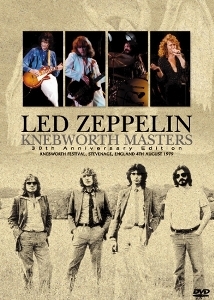 Knebworth Masters is hopefully the final word on Led Zeppelin’s first Knebworth show in 1979. A little bit of footage from this show circulated for almost twenty years, from the Swan Song video for “Hot Dog” and for a two-song fragment, “Ten Years Gone” and “Heartbreaker,” being taken from the Atlantic Records 40th Anniversary show in 1988. After the footage was utilized on the official DVD in 2003, the entire concert surfaced thanks to Watchtower on the two DVD set Secrets Revealed. Watchtower was pricey and hard to find however. A more viable option was The First Night (Boogie Mama) released soon afterwards. Boogie Mama utilized DVD9 dual layer disc technology to fit the entire show onto one disc. But is also had some issues with pixelation in the darker pictures on the video. Knebworth Masters claims to be from the master video which may be true. Unlike the other two prior titles, the pictures is almost perfect all the way through the entire show. The colors are a bit off in some of the brighter moments but overall the picture is sharp, detailed, colorful and very lively making the two and a half performance a joy to watch. Since the video was geared for the large screens above the stage to give those sitting in the back a view of the action, the shots favor intense close ups of faces, fingers, guitars and pianos. It is funny to see some of the strange faces Jimmy Page and Robert Plant make to one another, a subtly probably missed by much of the audience that night. The bonus material on disc three includes 8mm footage of the event, a BBC radio report by DJ Tommy Vance and several “works in progress” footage of “Rock And Roll” and “Heartbreaker” from several angels. It works well as a bonus to give one a historical context in enjoying the show and to hear what the press were speculating regarding Zeppelin’s Knebworth shows. This three DVD set now stands as the definitive version of this video. The importance of these shows is best summed up by author Dave Lewis, who wrote: “For many in attendance it was their first ever concert experience. For many it would be the only time that they would get to see Zeppelin perform live. For that reason alone it holds a special affection in their live history. The first show in particular, with so much riding on it, was perhaps the most important they ever played.” (Led Zeppelin: Celebration II: The ‘Tight But Loose’ Files). Journalist Chris Welch, fifteen years afterwards, observed: “Fans [at Knebworth] were still supporting the band, but there was definitely a feeling [Led Zeppelin’s] days were numbered. Audience reaction at Knebworth had not been overwhelming and many seemed content to stand and stare, like mesmerized spectators at an alien ritual, a far cry from the hysteria of earlier shows. Robert Plant seemed perplexed at the silence between songs, when you could practically hear a pin drop in that vast, cold field. It wasn’t until he led the way into ‘Stairway to Heaven’ and ‘Trampled Underfoot’ that roars of appreciation began to echo around Knebworth. Robert’s only comment at the end of the last show was a guarded ‘It’s been quite good.’” The soundboard tapes caused a general re-evaluation of the event which was given another boost when much of the August 4th show was used on the official Led Zeppelin DVD.